Empathy is valued as an individual trait--an ability to emotionally connect with another person and value their life experience in an authentic way. But what about our cultural institutions? At a time when “diversity” and “inclusion” are more critical than ever to the the future of our field, how can institutions themselves better reflect and represent the values of their communities? This assessment tool is proposed to help organizations move towards a more empathetic future. please contact us using our webform or via email. Five characteristics categorize the institutional and operational priorities of an Empathetic Museum. 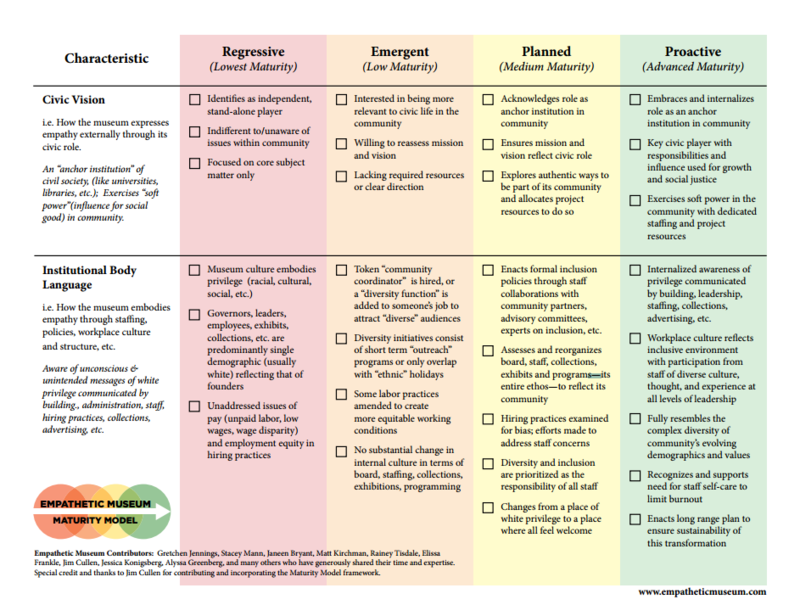 Each colored column in the rubric represents increasing levels of maturity in empathetic practice--Regressive, Emergent, Planned, and Proactive. Checked boxes identify your institution’s current level of achievement. Unchecked boxes represent goals for your institution, and can inspire organizational change, the reallocation of resources, or whatever it takes to reach the highest level of empathy within your organization. These categories were defined to capture the wide variety of ways that empathy can be reflected within and by an institution. Civic Vision, Institutional Body Language, and Community Resonance relate to institutional identity and relationships, both internal and external. Timeliness & Sustainability and Performance Measures focus more on operational functions and assessment. Civic vision is a matter of imagination and behavior. For museums to be 21st century civic leaders and relevant to the societies in which they reside (i..e. anchor institutions), their leaders must have the imagination (vision) to see their institutions in such a role: that they matter in their communities. Museums must behave as civic leaders, joining with other institutions of civil society to use their combined efforts to influence and shape (soft power) the quality of life in their community and the promotion of social justice in their municipalities. Analogous to personal body language, institutional body language refers to the powerful messages museums convey through unspoken and unwritten manifestations of their being: the design of their buildings, the content of their advertising, the behavior of front line staff to visitors, the demographics of their staff and boards, the choices they make in their collections, exhibitions, and programs. In the context of diversity and inclusion, museums’ body language often conveys the message that the museum is for the white, the wealthy, and the powerful. Such museums may have written diversity policies and goals, but the image presented to the public by the institution in its many manifestations speaks more loudly than written goals or mission statements. People of color and other marginalized communities get the message—this place is not really for or about us—and stay away. Just as an empathetic individual resonates with the thoughts, feelings, and experiences of another group or person, an empathetic museum is so connected with its community that it is keenly aware of its values, needs, and challenges. The best way to achieve this is through a board and staff that reflect the diversity of a community; advisory boards, collaborations, and partnerships also help a museum’s ability to be in touch with its community. Because an Empathetic Museum is so connected to its community (see Community Resonance), it is able to assess and respond to particular events or crises that affect its community (and beyond) in a timely and sustainable way. For example, if a museum is aware of racial tension in its community because of the racial diversity of its staff and/or strong collaborative community relationships, it can be well informed about what programs, exhibits, social media and other initiatives it might take within its mission and vision to address this civic issue. And it is aware that one-off efforts are not effective. It maintains a continuous and sustained awareness of and collaborative spirit towards its community and its needs. It is essential that any museum aiming to develop the characteristics discussed above incorporate goals related to them in its strategic planning and then assess and measure the effectiveness of these goals. An Empathetic Museum commits resources to regular assessment, not only of its revenues and attendance, but also of its public and social impact. Questions or comments? Examples of empathy at work in your museum?